I'm interrupting our look around Paddington and Bardon for this post, which is quite topical at present. 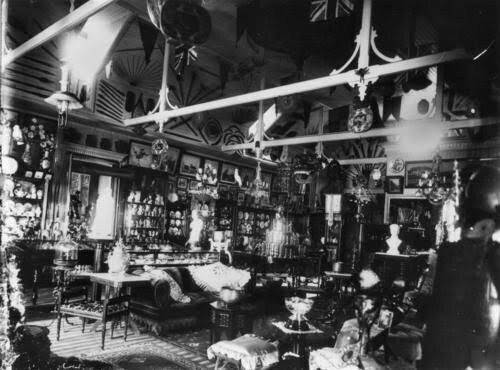 Apparently in days of yore, gentlemen's houses sometimes included a museum. This would be where the gentlemen kept those fascinating treasures one picks up on one's travel. Stuffed bears, lions' heads, elephant's foot umbrella stand - I think you are following me. Sort of like today's spare bedroom. Here's a picture from around 1895 of one such museum from a house in the Brisbane suburb of Hamilton. Admittedly, I can't see too many stuffed bears in there. It looks more like a collection of crystal, glass and pewter ornaments and so on. It is believed that the house that held these treasures was Lochiel, which was in the news recently. (No, they didn't find a stuffed bear!) Here is my recent photo of Lochiel. The reason that it made the news was that the present owners, who purchased the house for $6.4 million in 2006, had some alterations done to the residence, which happens to be heritage listed. Alterations (without prior approval by the Queensland Heritage Council) to these buildings is not allowed. When you purchase such a property, this information is part of the contract of sale. Further, the owners of this property own a business in the real estate industry, so it could be assumed that they would have been well aware of the rules protecting such a property. Anyway, this happened; it was dealt with by the courts; the owners pleaded guilty; they were fined; it was reported in the Courier-Mail. What then really shocked me was the reaction of some people who wrote letters sent emails to the newspaper. Here is a selection of three from literally scores of similar ones. I confess to a loss of personal identity here, because I just don't get that reaction. Am I an "elitist" (sorry John Howard!) or worse still, a wanker? Or are these emailers merely bogans with no sense of history? It's no wonder that the state's heritage properties are going to hell in a hand-basket. I admit that the house may not be everyone's cup of tea - it has been described as being of "eclectic design" and "idiosyncratic". But this house was built in the 1860s, should it not be preserved? And should we not enforce the laws that enshrine that preservation? Read about the house and the lifestyle of its then owners in this article from the Brisbane Courier of Thursday 16th May 1907. And here's a picture of the area from 1868. 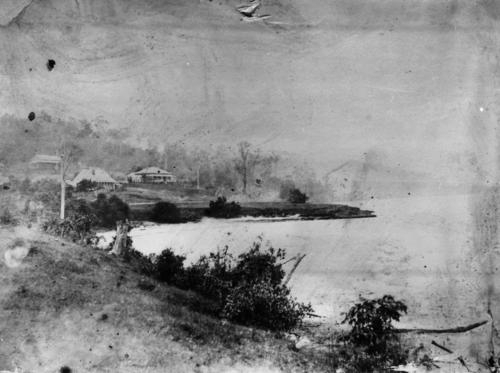 It shows the original part of Lochiel (then known as Runnymede) in the centre of the photo, and the rocks to the right of it are named Cameron Rocks after the then owners. The social fabric of our history is in these buildings, we need to look after them. I liked the 1907 article re the Camerons. It's distressing, isn't it, to think that so many people do not value our heritage. There seems to be some inconsistencies too - it's OK for me to knock down a heritage property, but the government shouldn't do it! I read your great post on Lochiel - thanks for the link. If I say that I only read it for the sports news, am I excluded? Hello, long time reader, first time poster here. It is comments like these in the courier mail that really make me doubt the intelligence of the people in our city. Reading through comments all I read is complaint after complaint about anything council does, regardless of whether it is a bold public transport plan to ease congestion, or scenarios like these where they actively (thank god) try and protect our heritage buildings these days. Although I am still very young, I have lived in old QLD'ers my whole life and adore the character of every one I have lived in. Just think, if the readers of the courier mail were running our councils we would have outer-suburban style brick abominations littered all throughout the inner city. I lived in Lochiel when it was flats. And the flat I lived in was the former 'museum' section(it had the same alternating colour timber floor as above - a flase ceiling concealed stained glass windows in the roof). The owners, descendants of Cameron, intended to knock the place down, so we all had notice to go. One of the tenants began a petition to the Council to prevent the demolition of Lochiel, by then in poor repair and never having been maintained. Lochiel was on a 'Heritage Trail' and featured in a little booklet of places of interest in Hamilton, however, it wasn't heritage listed. We all felt strongly that the building was worth saving. It wasn't out of spite that the petition was drafted. So we were happy when council blocked its demolition. However, the new owner renovated it to within an inch of its life, and flattened the gardens, which featured an ancient magnolia, paths, and a little blackbean forest. It is still a beautiful building. The subsequent renovation that landed the new owners in trouble was the demolition of a cellar, I recall, presumably to build rooms underneath. There has been an attitude in Brisbane that once you destroy something, the council won't do anything since it is too late to save it. Any fine would be absorbed by the profits from the demolition. I was there the night the Bellevue Hotel was torn down. I heard the demolition was in progress over community Radio ZZZ at about 10pm. A woman who had printed up 'Save the Bellevue' postcards, was handing them out while dozers knocked it down, in tears. It was the Governments intention to let the building fall into such a state of disrepair that demolition was warranted. They had taken the roof off some time before to 'help things along'. This is a tactic that private owners engage in, as well. Letting old buildings fall down. So I think the saving of Lochiel was definitely a victory. It would have been demolished if not for the action of a few concerned citizens! Can I just say that the current owners also have a similar approach to parking their expensive cars as they do heritage laws ... who cares about a fine. LOCHIEL is up for sale if anyone has the $$$$$.